The real adventures in Khmer cuisine won't take you just into the kitchens of restaurants. 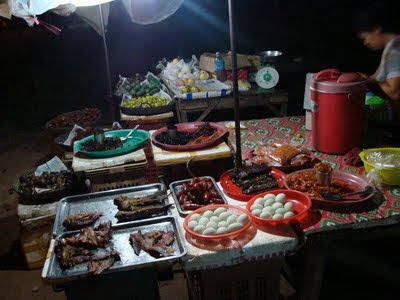 For adventurous eating, Cambodia is without parallel and its street foods push the limits like nothing else. 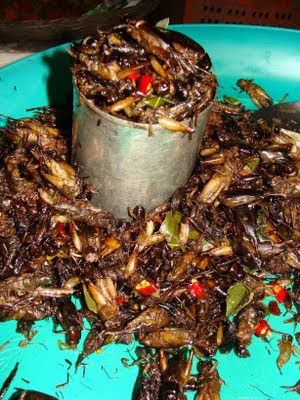 From bugs and spiders to snakes and dog, Cambodian cuisine spans the mild to the harrowing. There are also "rules" to eating street food if you don't want to spend the rest of your vacation in bed or on the toilet. The first rule is eat where locals are eating. While they have a much hardier immunity to some of the potential local food pathogens, even they get food sick from eating bad food. The second rule is eat hot and never raw. Foods that have grown cold have a much more likely chance of doing something nasty to you, and raw foods may be washed with unsanitary water. Having said that, I do break all of these rules, sometimes simultaneously, for the pursuit of something that might just be delicious. Perhaps the cuisine of street food is also a testament to the hard history of the Khmer people, the blackest period of course being in the late seventies when famine claimed thousands of lives under the oppressive regime of Pol Pot and the Khmer Rouge. With many of the members of the regime now on trial for genocide and crimes against humanity, Cambodia seems ready to face its dark past and face a brighter future of wider prosperity. While poverty is still rife in the kingdom, today for those who can afford it there is an abundance of food ranging from buttery baguettes to what the Western palate would find exotic and perhaps even unpalatable. 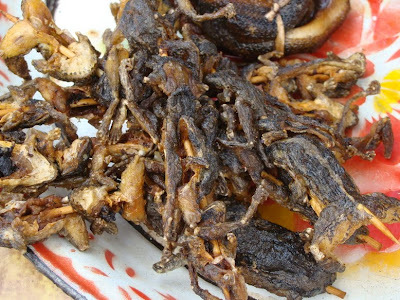 Frogs feature prominently in street vendors smörgåsbords from small whole fried ones to chunks of hot roasted frog flesh. Duck eggs are also common sights. One of the more interesting dishes are the duck and chicken eggs that contain--guess what--a nearly developed chick! These are consumed out of the egg with a spoon, down and all. Catfish roasted on a splint are omnipresent, and most of these have only been out of the water for a few hours. Snack foods include a variety of roasted meats as well as fried arthropods like grasshoppers, water beetles, and even enormous spiders. Fortunately or not, most of these treats simply taste like crispy (or gooey) bursts of oil. The snakes pictured (like the chicken legs and organ meats) are not meant to be eaten as is, but are used in a variety of Khmer dishes from curry to soups. More heartier street food includes a seemingly numberless range of soups, fried rice and noodle dishes, as well as curries and even fish head souffle. 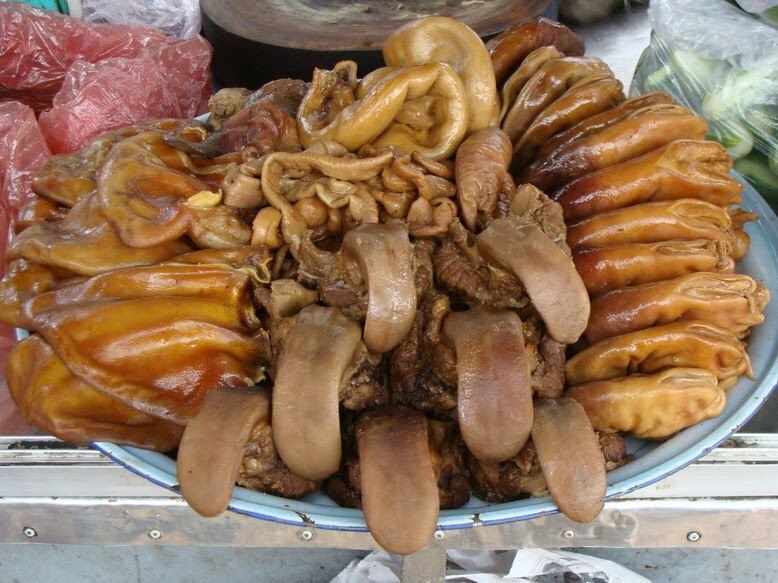 Many of the vendors go through some lengths to make their food displays appealing such as the carefully arranged platter of tongue and other organ meat pictured below. Other foods you won't find even in the streets or on a menu. Rats, mice and dog are also Cambodian fare. Dog is easier to find than the former two. If you are interested in eating traditional Khmer-prepared dog, ask a tuk-tuk driver if he can take you somewhere to eat this dish. The meat has a strong flavor, but you will find it to be unlike anything else. It has a bit of a gamey taste, and has a toughness much like mutton, but the taste is truly unique. The North Korean run restaurants also serve dog prepared in a traditional Korean manner, but it will cost you dearly. When you eat dog, you know it is dog but it looks like any other meat dish. The flavor, though distinctive, wouldn't alert you to the fact you are chowing down on a chow-chow. Other foods, though, can be more challenging to consume. Tarantulas are case in point. 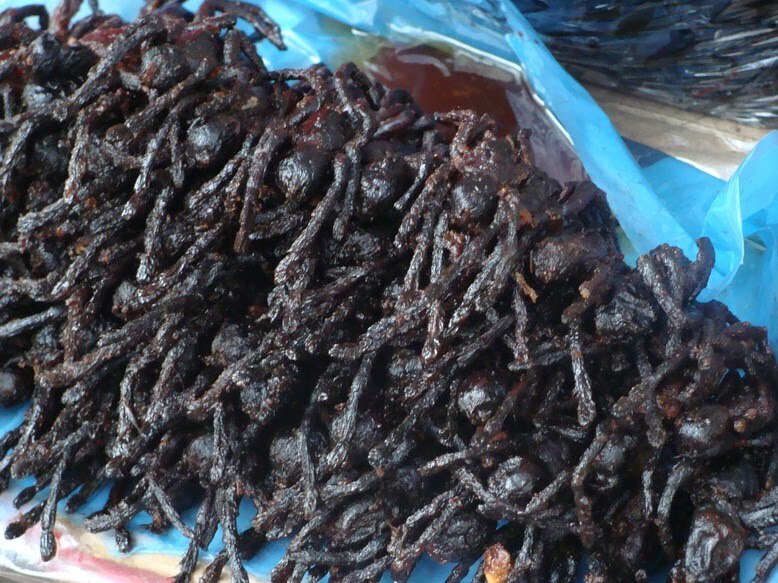 These delicious treats (think soft-shelled crab) are a bit hard to bite into, whole, fried, and undeniably a big hairy spider. But, when in Cambodia, do as the Khmer do . . . while nothing notable here, eating hairy tarantulas definitely earns you bragging rights back home.